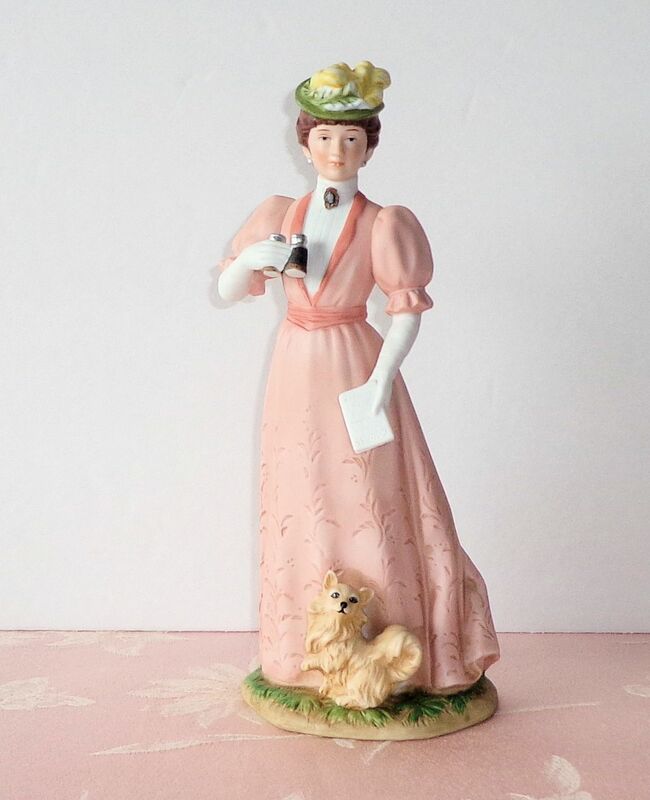 Sometimes when I’m winnowing thrift shops for great finds to fill my own online stores, I come across a HOMCO lady. Recently I found six at once! These handpainted porcelain beauties are about 9″ tall. 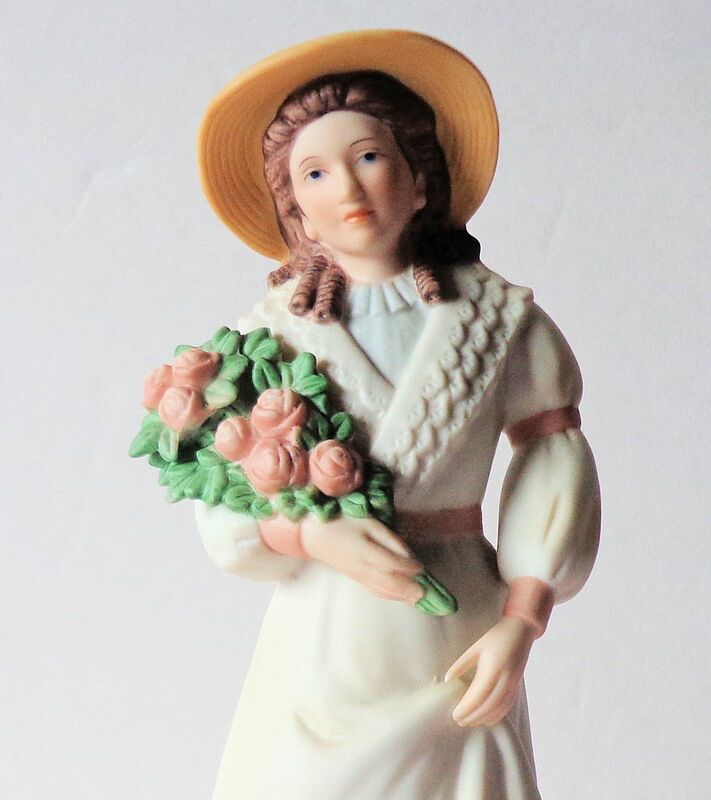 They were sold by Home Interiors and Gifts, a purveyor of fine porcelain figurines. 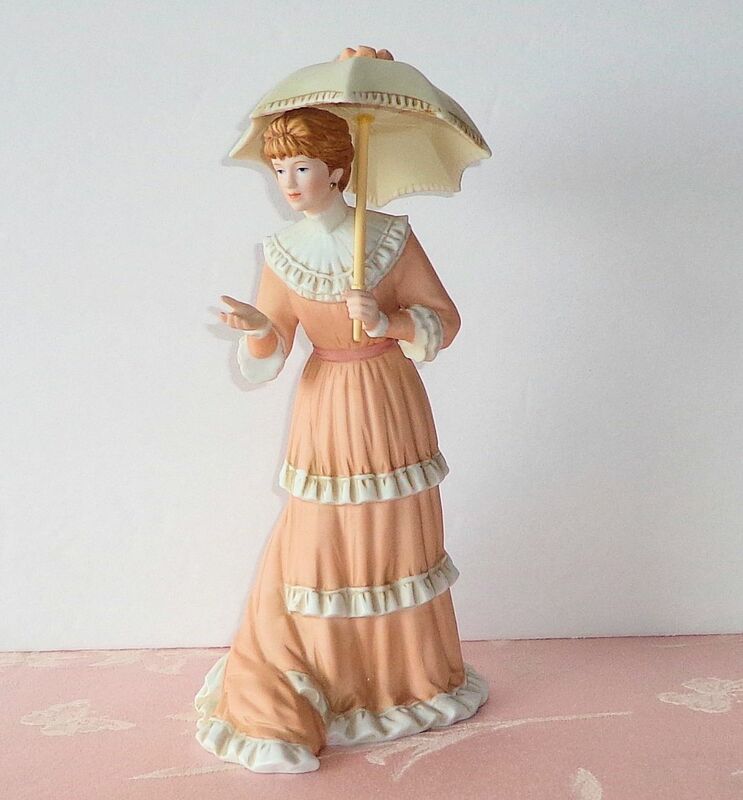 Called Victorian Ladies, these collectibles sell well, with some being highly sought due to rarity or great beauty. The lady with the parasol is the most valuable in the set pictured above. 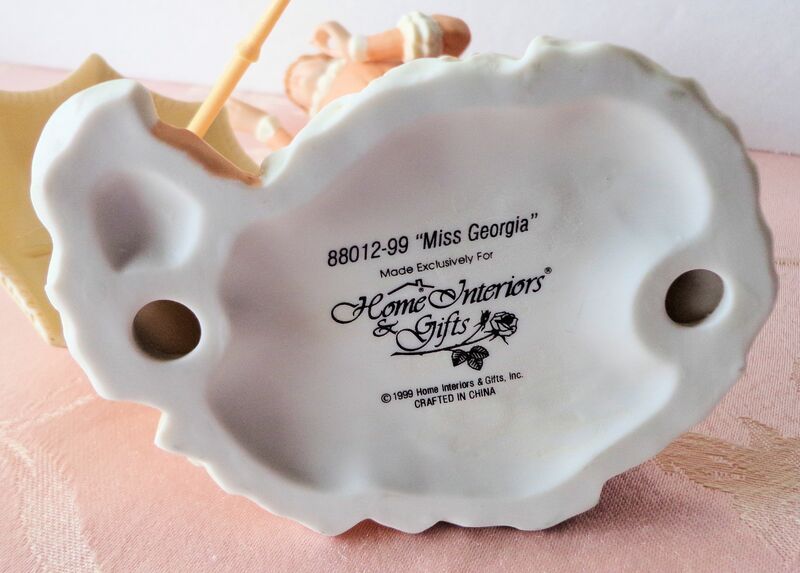 Most ladies have names, the parasol woman is Miss Georgia. The seated lady is Courtney. All these figurines are currently for sale in my eBay shop. The history of HOMCO is quite interesting. The business was founded in Texas in 1957 by Mary C. Crowley, a single mother of two. She had been working for others and wanted to do more. She scraped and borrowed enough cash for a start up. Her business was based on part-time sellers, women who were mothers like herself and needed extra money. The sellers were called “displayers” and the wares were displayed in homes. The saleswomen kept about 60% of the profit from each sale. The merchandise was all carefully selected decorative items and useful objects for the home. Mary’s business grew so that by the early 1960s she had $1 million in sales. Her philosophies were maintained throughout the time she ran the company, even when her children became the operators. The salespeople were all women and her business was based on Christian values. Many of the items sold had religious significance. By the 1980s her business was making multi-millions in profits. Mary passed away in 1987. The company was finally sold in 1998, and went bankrupt in 2008. 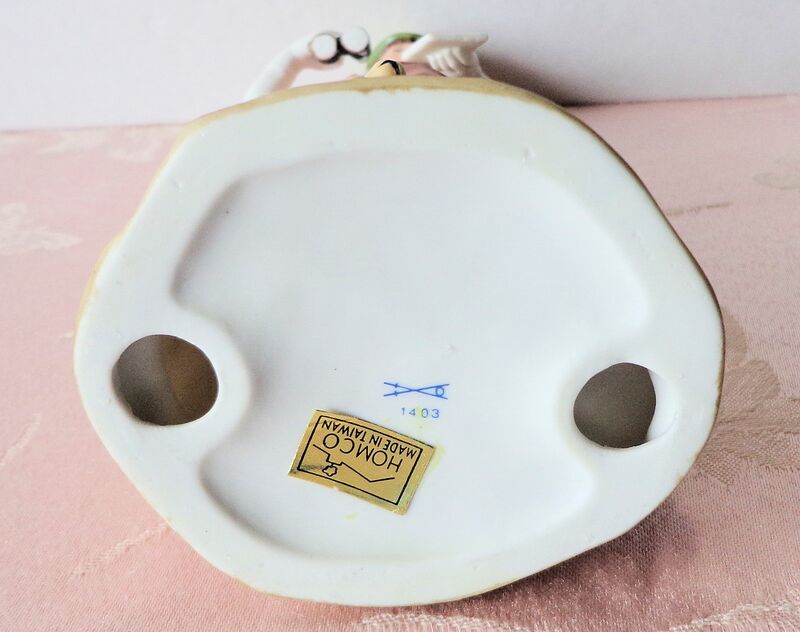 It was bought by Home & Garden Party. 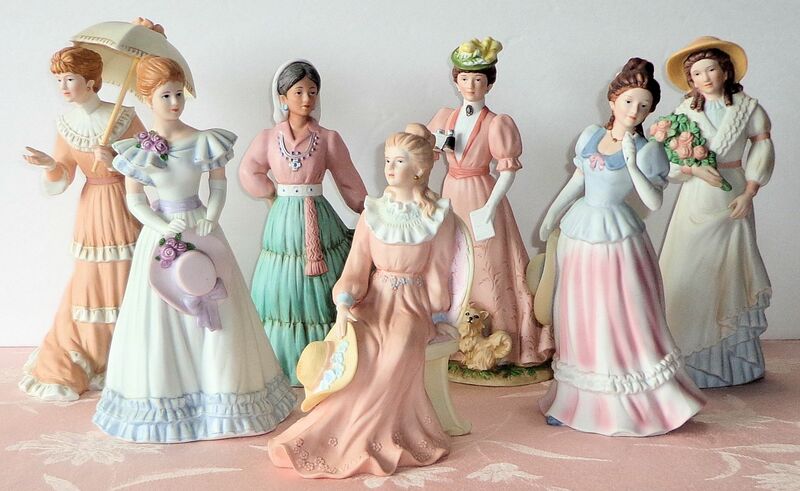 The Victorian Ladies are just one of the popular lines. Denim Days, figurines featuring children wearing denim are very collectible. Also in demand are the Nativity series and the teddy bears. 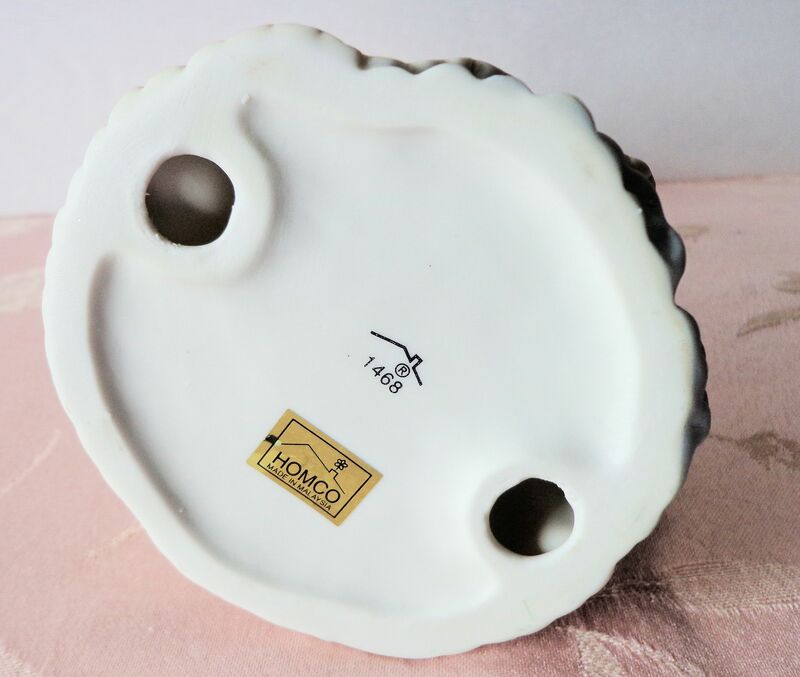 The HOMCO marks include an early crossed arrows with four feathers, later crossed swords and house roofline with chimney, most included numbers to identify the particular model. Many figurines are identified today by the model number. 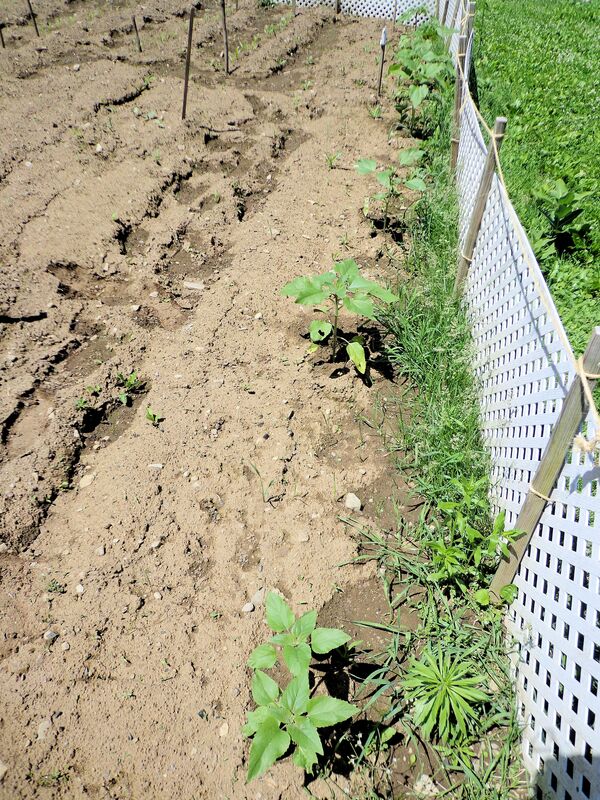 Good news from the hayfield, two invasive plants are declining. Last year around this time I blogged about crown vetch and yellow rattle, weeds threatening our hay supply. 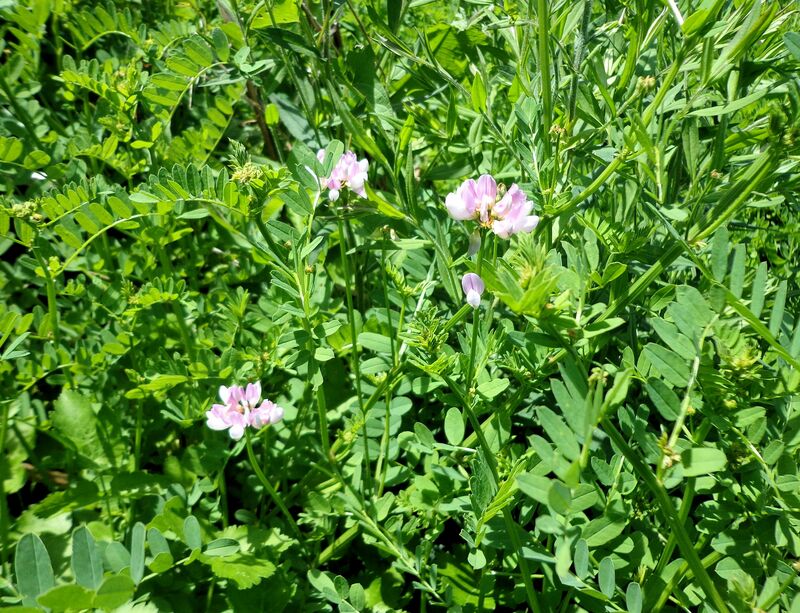 Crown vetch was introduced to the roadside by the state and has slowly spread into our fields. Yellow rattle came to the fields from other farms, hitching a ride on haying equipment. Crown vetch is a hardy and persistent perennial forming solid colonies as it kills grasses. The vetch is toxic to horses, not good in hay. The best way to kill it is to mow every few weeks, preventing it from blooming and seeding. Over time, as it is unable to reproduce and spread, it will be out-competed by faster growing grass. 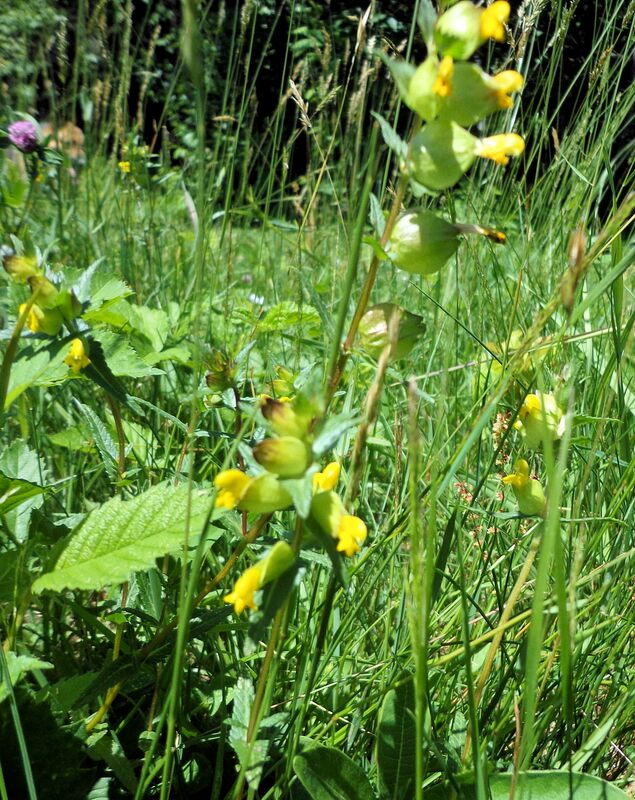 Yellow rattle is an annual parasitic plant related to snap dragons. 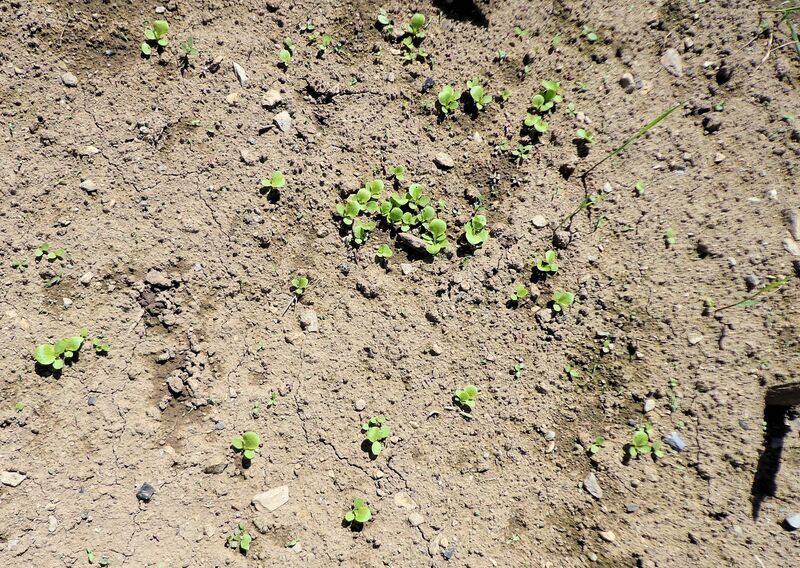 It feeds by pushing roots into the roots of other plants, weakening the surrounding grass and clover. The seeds are produced in round pods that rattle when they are ripe. 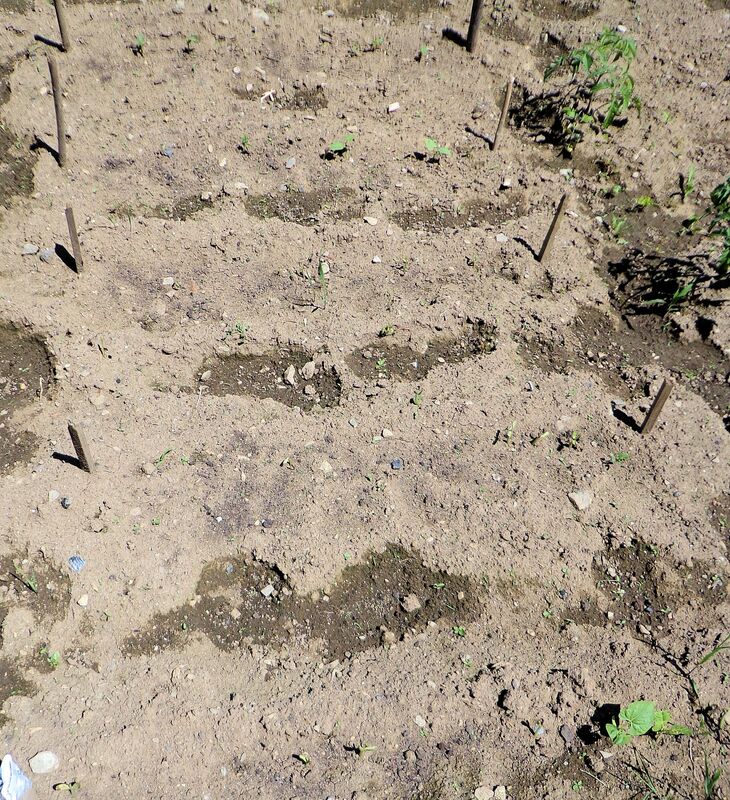 By mowing before seeds are produced, rattle can be destroyed. 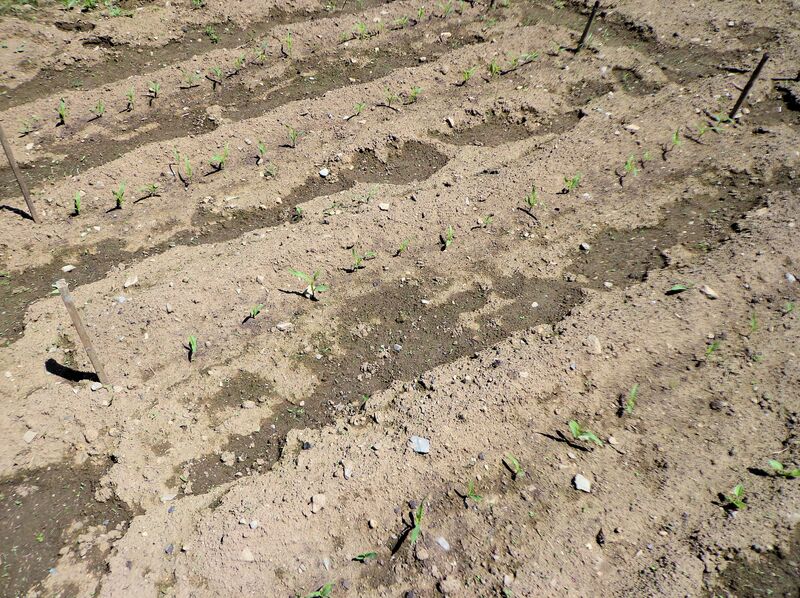 Any seeds produced are viable for 2-3 years. To kill the rattle, last year I had to sacrifice my hayfield by mowing early with the bushhog. If I had waited for the farmer who cuts my hay, the rattle would have bloomed and made millions of seeds. 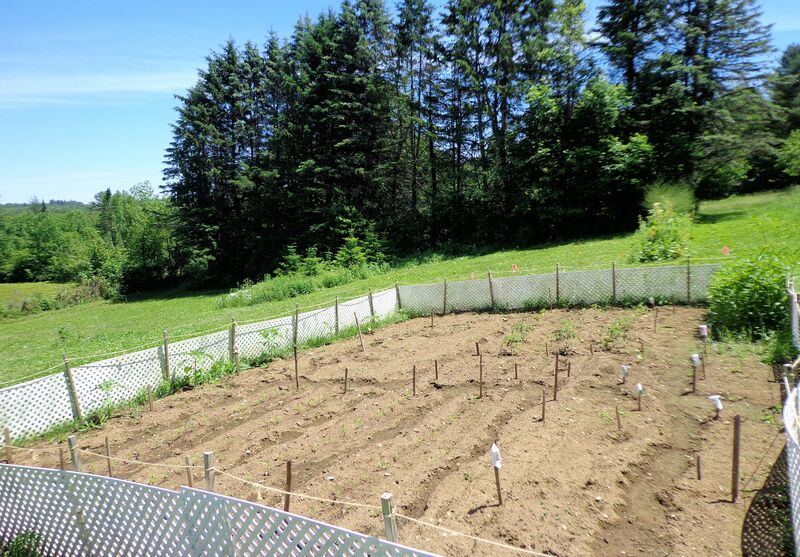 This year I estimate the weed has been reduced by 90%. 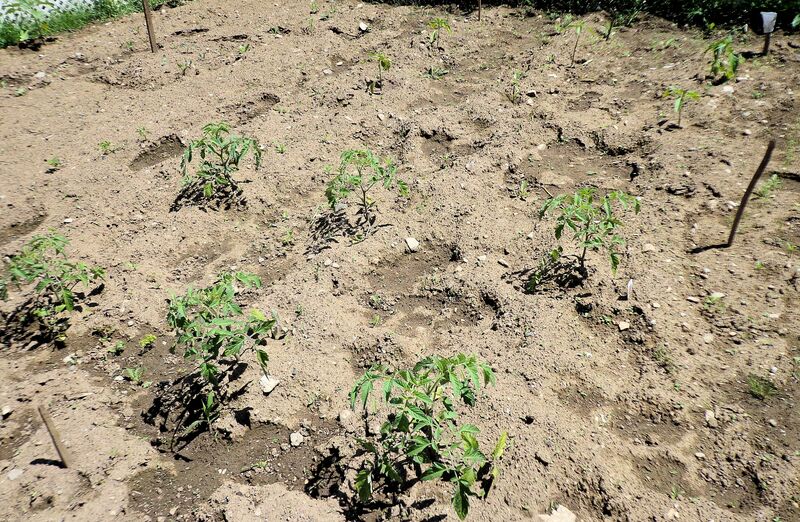 Many areas infested last year are clear this year. Once again I am mowing with my bushhog, losing some nice hay, but gaining a hayfield. I hope next year we are 100% rattle free. The crown vetch was mowed four times last year. It is severely curtailed. Where the vetch ruled last year, it is now struggling in the shadow of tall grass. By cutting it before it could bloom and seed, and repeatedly cutting it to allow the grass to dominate, I have won a major victory against vetch. This year the hay from former vetch areas can be used. The victory is not complete. Many more hours of mowing will be required to eliminate crown vetch. 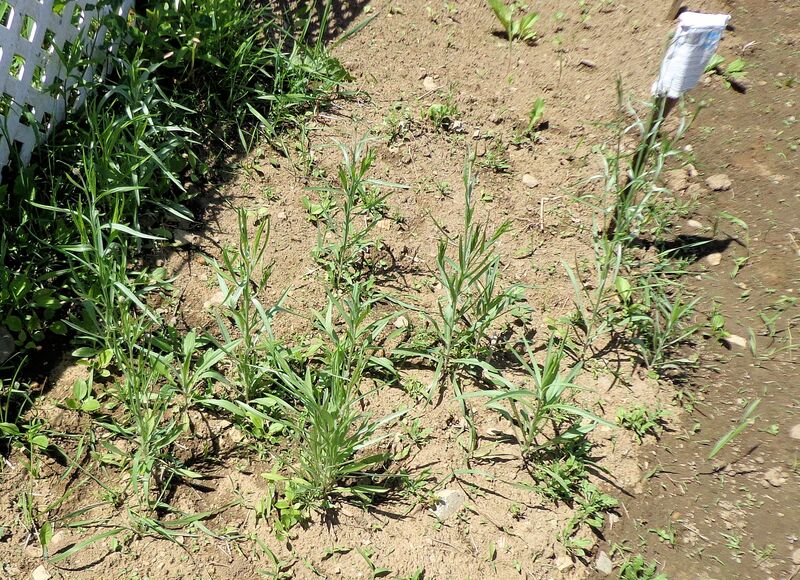 It may not be possible to completely eradicate the weed. It sneaks along fence lines and crowds up against tree trunks, places where the mower can’t reach. A little here and there can be dealt with. Acadia National Park is a favorite destination for me, a place I have visited yearly all my life. Yet, after all this time, there are still areas I haven’t enjoyed in the park. 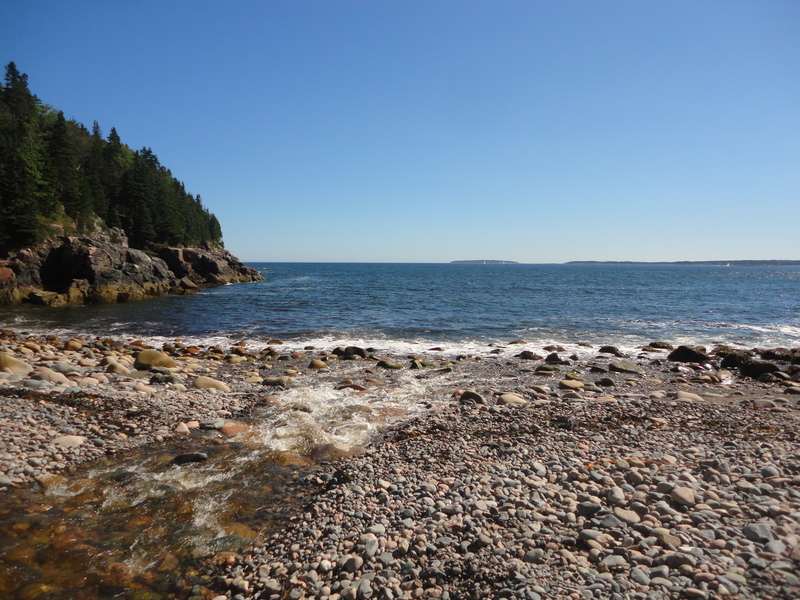 I make a game of finding a new spot to explore each time I go to Acadia. Hunters Beach is a hidden surprise I stumbled across last year. Yesterday I went there again. The trail head is near Seal Harbor on Cooksey Drive just off Route 3. Finding it the first time can be a trial. The spot is not marked and has a tiny parking lot tucked in the woods beside the road. 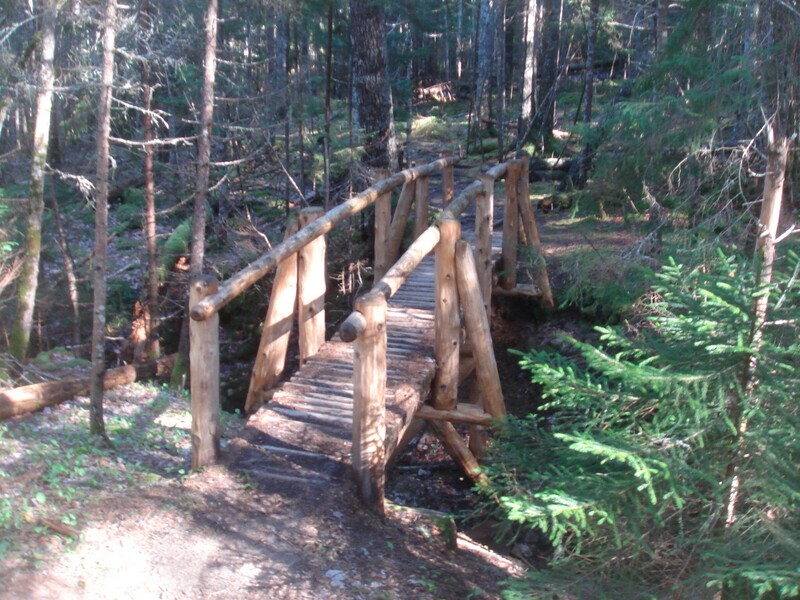 The trail is about 0.2 miles long, a short hike that is fun and easy for families. The trail passes through a woods predominated by tall spruce. 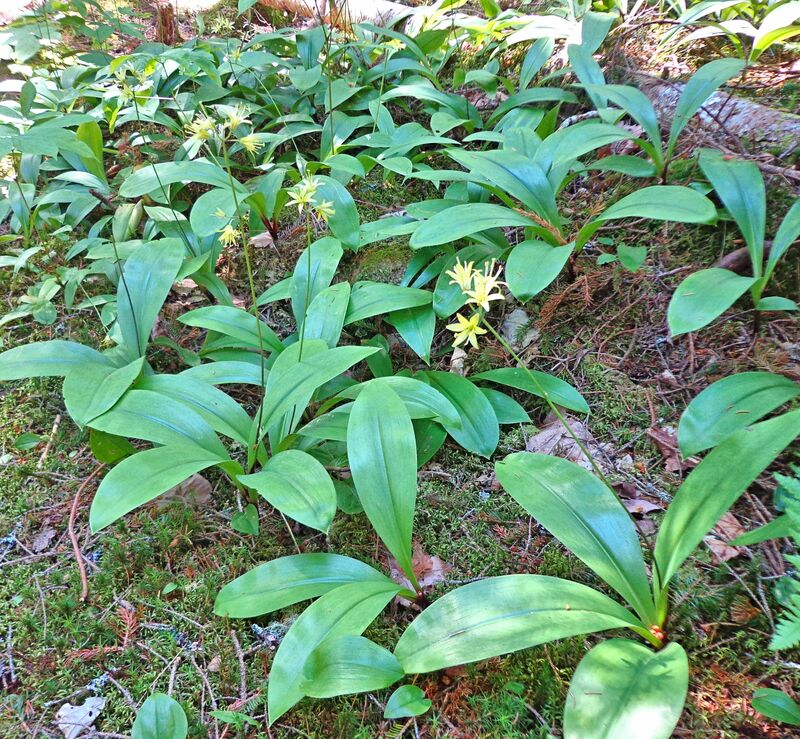 Yesterday Clintonia lilies bloomed along the path. 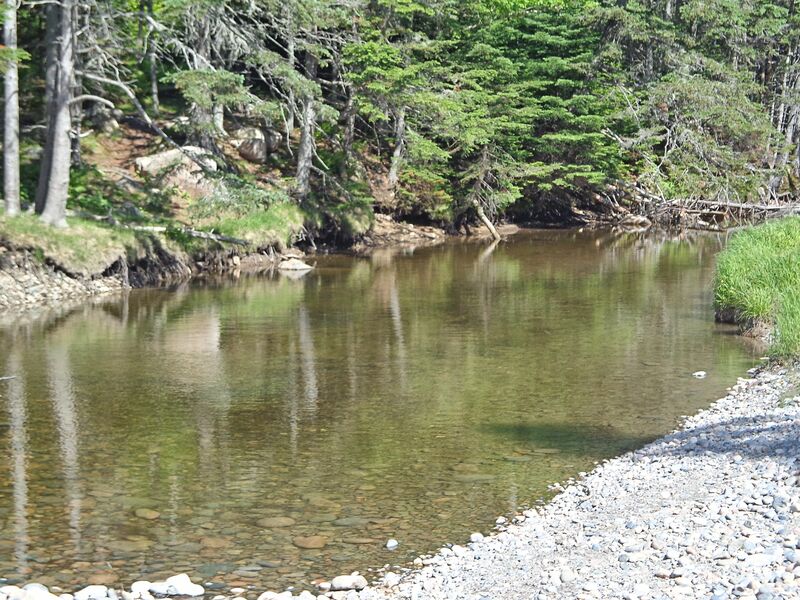 After crossing a narrow footbridge made of logs, the trail follows Hunters Brook to the sea. 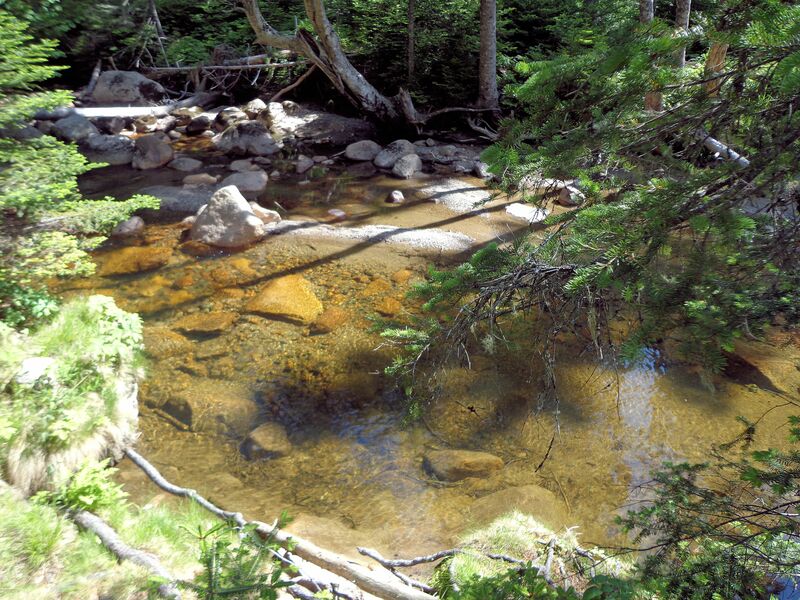 The brook has beautiful crystal clear, cold water. There must be some small trout swimming there. The woods is thick and cool, floored with moss, spruce cones, ferns and conifer needles. Yesterday hermit thrushes trilled from the canopy. Thick roots twist across the pathway like snakes. The gurgling of the brook is a constant companion. Before there is a chance to get tired from the walk, the way opens onto a tumbled stone beach. The surf surges up over the rocks then pulls back dragging small stones to rattle against one another. Hunters Brook disappears into the piled stones of a low natural seawall only to emerge on the other side in a rush to meet the ocean. 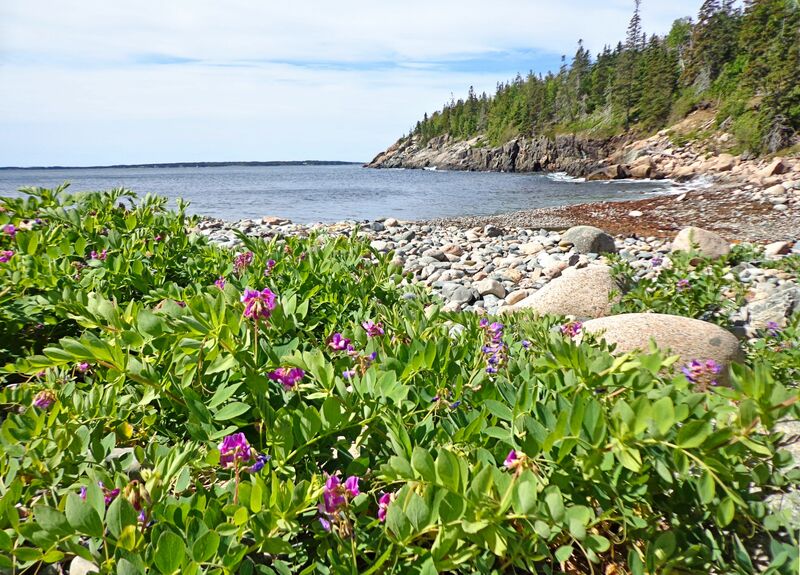 Wild roses and beach peas edge the shore. Hunters Beach Trail is a walk I will take time and again. A little gem at Acadia. 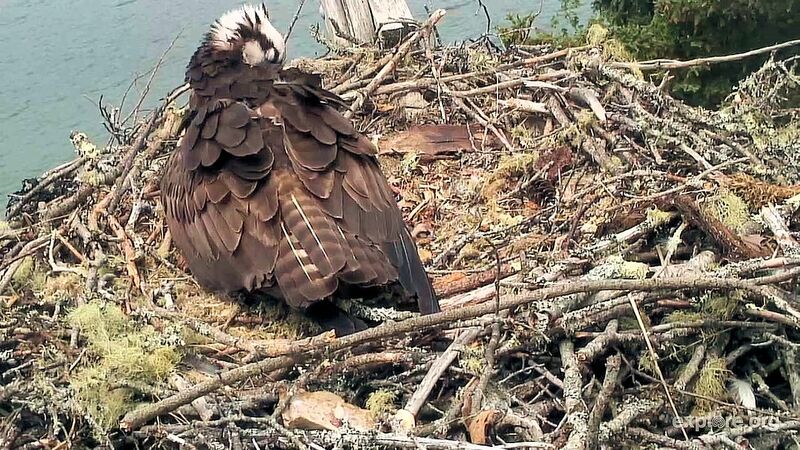 The osprey on Hog Island here in Maine have hatched some babies! I took this shot this morning from the live webcam of the nest. You can see one hatchling looking out from the right side of the mother. It has a black stripe by its eye. Looks like two of the three eggs hatched. I’ve periodically monitored mother osprey over the past 40 days as she patiently sits on the nest through heat and cold, high winds and rain. One damp day in the drizzle her wings were beaded with rain. On a scorching sunny day she stood over the eggs panting, casting a shadow to keep the eggs from overheating. Her diligence has paid off! I have yet to see her mate. Supposedly he is off hunting food for her. He must be doing something since she survived the incubation. Now both parents will be hard pressed to find fish to feed their rapidly growing, hungry babies. Maddie, full name Platinum Madrigal, is half paint Saddlebred and half Paint (of Quarter Horse blood.) 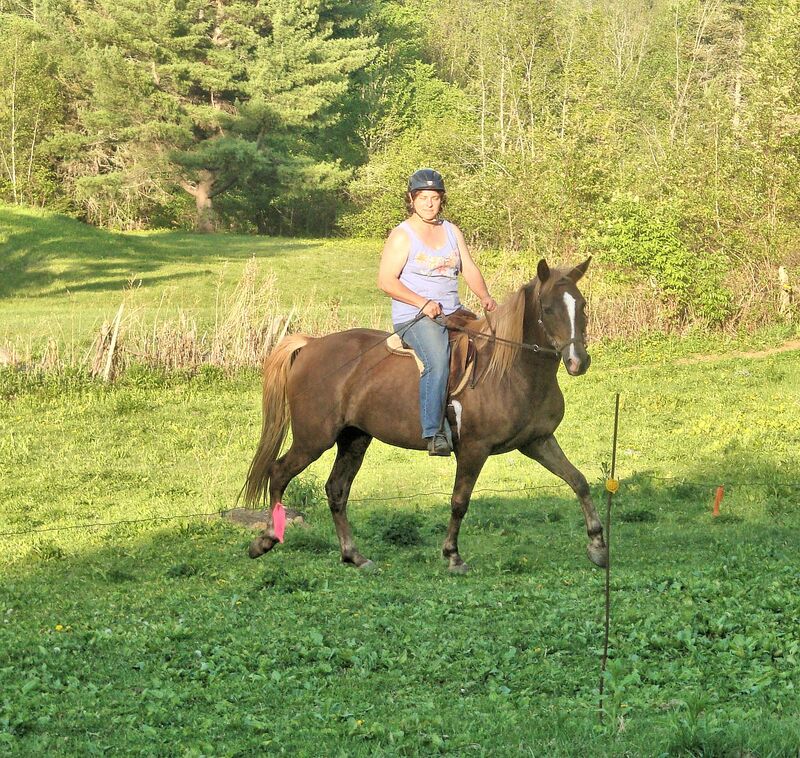 She is a chocolate palomino, eight year old mare. Because her breeders wanted a color foal (paint,) and Maddie turned out this odd, but to me, beautiful shade, they sold her for a very reasonable price when she was a yearling. I always dreamed of having a palomino, so I’m thrilled. Unfortunately, many people should not be raising horses, including Maddie’s breeders, because she had next to no training when I received her. She could lead, more than I can say for my other horse, Vista. I also got her as a yearling and she had zero training. Other than leading, Maddie was pretty clueless. Worst of all, she had no respect for people. She had been raised around a little girl who treated her like a dog, a very mannerless dog. 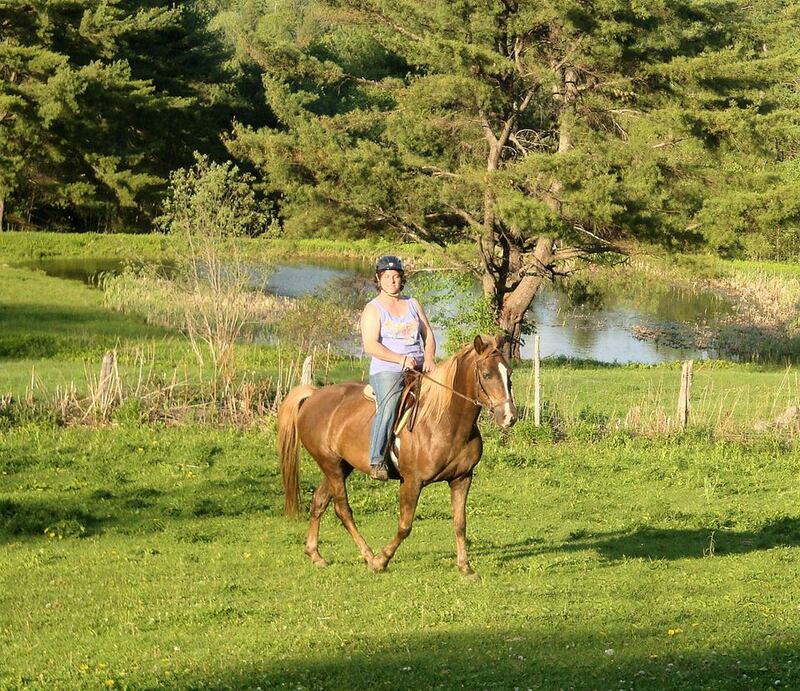 When I got her, Maddie thought people were just other horses; smaller, less powerful horses that she could bully. She would even put back her ears and threaten me, like horses do to each other. It took several sessions of ground training in a round pen for Maddie to understand that the space around a person is to be respected. Now, she can mostly be trusted to work around. I never fully trust any horse. The filly also never had her feet handled. Horses need their hooves trimmed at least every eight weeks, so a horse that won’t cooperate is a dangerous animal. It took me many patient hours to teach her to stand with one hoof held up. She does very well now and the farrier is always happy with her. Having her hooves handled was just the worst part of Maddie’s lack of experience. It quickly became apparent that the horse had never been adequately gentled by having her whole body touched by human hands. This is something that a good breeder does very soon after the foal is born. The hands are gently run over every inch of the horse. (I recommend gloves for the stinky parts!) If begun when they are young, the human touch is always welcomed by a horse. Maddie did not welcome anything more than scratching her neck. I am still working with her on this issue. Luckily, I’ve only been kicked once when I touched her belly. She kicked from surprise, I think, not anger or warning. She is MUCH better than when we started. Vet visits were at one time another disaster with Maddie. She would not tolerate injections. A thousand pound animal that doesn’t want a shot is a very dangerous beast. Vista would watch with wonder as her pasture mate freaked out. The older mare never moves a muscle for shots and has never required a twitch. The only thing that has worked to calm Maddie is a lip twitch. Now, I know some people don’t like the twitch. They claim it is inhumane. A properly applied twitch is not inhumane. It is very effective. I use only a rope twitch on a wood pole. The rope is tightened around the upper lip and held for only a short time while the shot is given. It works by causing the horse’s body to release endorphins that ease pain and bring a happy and relaxed feeling. Using the twitch has turned Maddie from a threat to the vet into a pliable patient with little effort. It worked immediately. Maddie doesn’t mind having the twitch applied, she holds her head down for it because she knows she gets a treat after. This horse will work for treats. One day, with experience, she will learn that shots aren’t that awful and the twitch will no longer be necessary. I am now able to give Maddie all her shots myself, except the rabies, which must be administered by a vet. The animal has a strong mind of her own. She is very smart for a horse. Most are considered to have intelligence comparable to a three year old human. Maddie is more like a five year old. Training her to ride has been a challenge. Things progress pretty well until I want to go in a direction she is not comfortable with. Then she refuses to budge and pins back her ears. The ear signal is often the only warning that a horse is ready to buck, or even worse, rear. So far we have not had to experience either of those aside from a little crow-hop once when she first started under saddle. Maddie responds to treats, kind words and scratching. She reacts badly, even violently, to a raised voice or the touch of a riding crop. The lunge whip frightens her, although she has never been hit with it. Maybe she had some very early bad experience with a whip that scarred her, who knows? So, when the horse lays her ears back and balks at a request I make when riding, I redirect her. We turn in a circle, and as we swing around to the way I want to go, I again urge her in that direction. Usually that is enough to get her cooperating. If not, we repeat until she behaves. Horses do best when they are moving forward. Standing allows them to think about things and work up a really good fit. Walking, even just to circle, moves their mind away from what is bothering them and they quickly forget. Usually. My mare, Vista, who is 26, is still fearful of woodpiles. She has been so her entire life. No idea why. She will never forget that a woodpile is actually a dangerous monster lurking in wait, no matter how old she gets or how many woodpiles she passes safely. She is the same way about blue tarps. So far, Maddie has shown great bravery around woodpiles, although the pink kiddie pool is pretty horrific for her. She has the ability to overcome her fears with exposure, unlike Vista. This is another indication of superior intelligence in a horse. I’m not certain that having a really smart horse is a good thing. She is constantly challenging me. As time goes by, we will see how useful extra brains are for a riding horse. 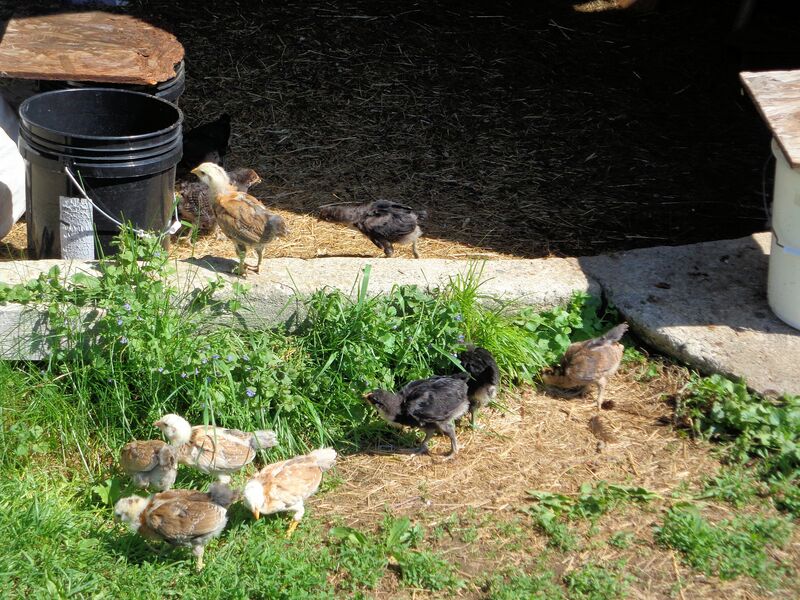 The Ameraucana chicken fledglings are three weeks old in these photos. 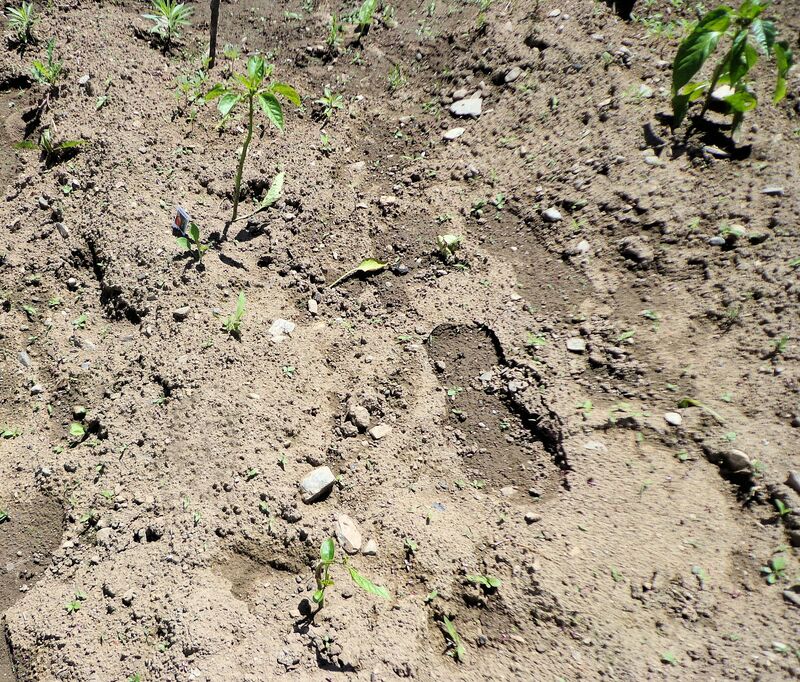 They are just beginning to explore the big world beyond the enclosure where they were kept safe as hatchlings. The chicks stare out from the safety of the barn into the great green world. The lure of grass, sunshine and tasty bugs helps them overcome their fear of the unknown. Sunlight streaming through the barn door makes a wonderful place to stretch out. Chickens originated as jungle birds. The love of warmth is in their genetic code. The little guys plop down wherever the sun is bright to spread their wings and absorb the heat. Their response to sun seems automatic. Hatched in early May, these chicks are growing fast. Their fully feathered wings and relatively light-weight bodies make them good fliers. I have to cover any buckets holding water to avoid calamity. 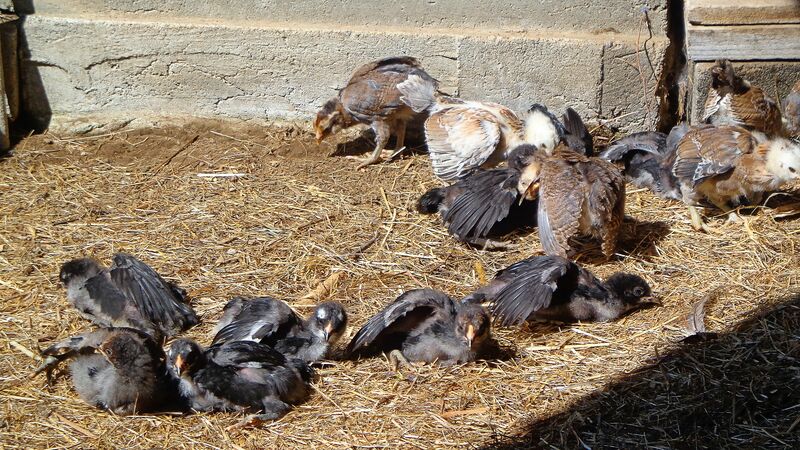 Chicks have accidentally flown into water buckets in the past and drowned. Because they are not swimmers, they panic, inhale some water and quickly succumb. The same thing happened to a wild turkey poult in my horses’ watering tub last year. Very sad. These young chickens grow more brave every day. In a gang, they adventure farther from the barn and discover new places where they can hide quickly if danger threatens. Soon their sixteen little siblings that hatched last week will join them in the barn. With plenty of exposure, the two ages of chicks will come to tolerate each other. When this winter arrives, they will be friendly enough to form one big flock. 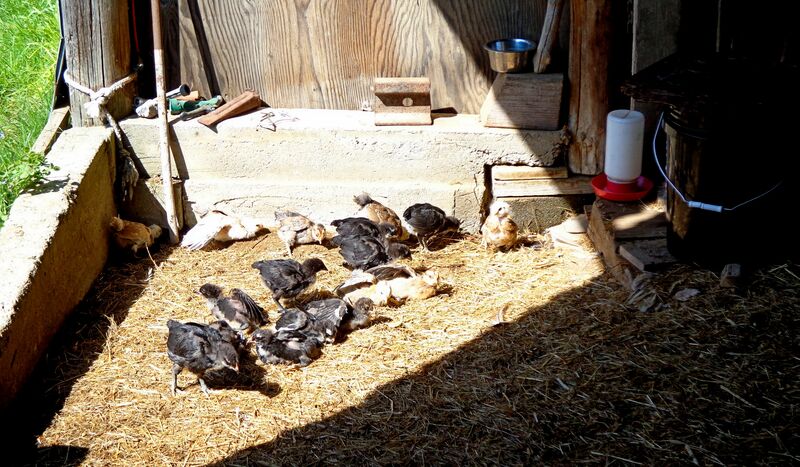 This entry was posted on June 3, 2015, in The Chickens and tagged ameraucana chicken, bird behavior, farm life, free range chickens, raising chickens, raising chicks, rural living.